Recently, I bought a new lens for my camera: a Canon EF 100/2.8 Macro USM. As this lens has a larger diameter than the EF 50/2.5 Macro I use for my regular satellite imagery, it is able to capture fainter stellar objects. Of course, the Field of View (FOV) is half as small, which makes it less fit for imaging objects in LEO (Low Earth Orbit). It is more suitable though for imaging distant objects in HEO (High Earth Orbit): satellites which are at thousands of kilometers altitude (including, but not restricted to, Geostationary satellites). The brightest of these are around magnitude +8.5. 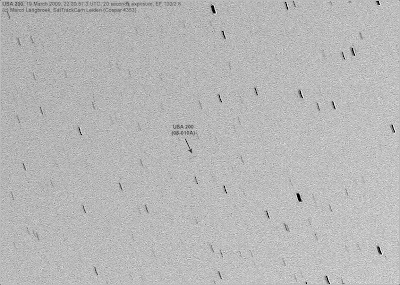 Yesterday I did some first succesful experiments on one of those objects: USA 200 (08-010A, NROL 28), an NRO ELINT satellite launched on 13 March 2008. It is in a Molniya orbit and as I imaged it, it was at an altitude of 29 564 km above the earth, and a distance to me of about 29 920 km! Hovering (well: not really. It is slowly moving in its orbit) high over Iceland at that moment, it keeps a watchful signals eye over the northern Atlantic and arctic. I shot a series of 20 second exposures, from stationary tripod. The satellite showed some movement during these exposures. below photograph shows one of the images: the satellite has made a faint short trail perpendicular to the star trails. 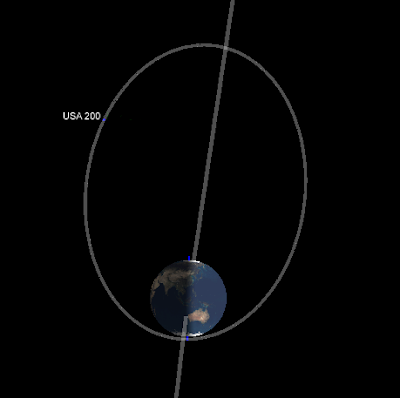 The images below show the orbit of USA 200. 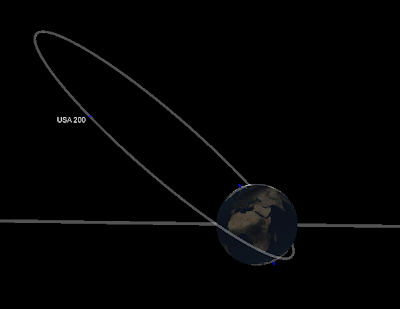 The Molniya-type orbit means it orbits about twice a day, spending only little time in its perigee at low altitude over the southern hemisphere, and most of its time in the hight altitude parts of its orbit over the high northern hemisphere, its surveillance area.